Sarah and I left from our campground in South Carolina this morning for the long drive to Kings Dominion in Virginia. On the way out of the Charlotte area we took a short diversion off the freeway to get breakfast at McDonalds and drive past the Charlotte Motor Speedway. 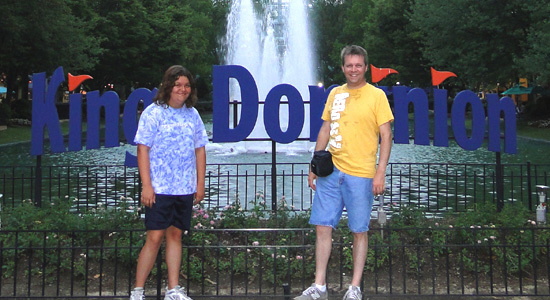 Once we arrived at the Kings Dominion Campground we set up the tent and caught the shuttle bus to the park. Sarah and me in front of the fountains. 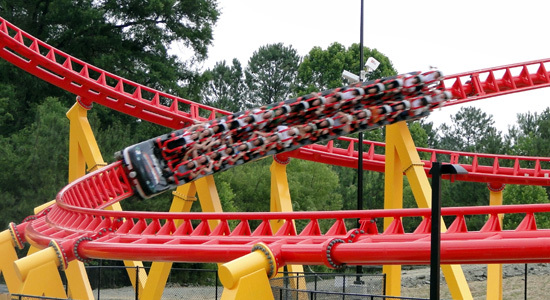 First on our list was a ride in the front row of Intimidator 305. As we slowly worked our way to the front of the line, I noticed that there was water on the trains as they left the station and began their climb up the lift hill. It wasn't raining so I was very curious where this water was coming from. Once we were near the air gates I could see that under the loading platform there were dozens of small hoses gently shooting water on each of the road wheels. Do the wheels and bearings really get that hot? Millennium Force is just as taller, longer and just as fast and it doesn't have problems overheating. I wasn't about to let some band-aid engineering stop me from riding this steel monster. The ride up the lift hill is quick and is a thrill of it's own. The first drop is just like Millennium Force, a total blast. The second hill didn't produce the great airtime that I was hoping for. It's not nearly as good as the third hill on Millennium Force. The rest of the ride with its quick changes in direction and poorly designed over-the-shoulder restraints was an exercise in defensive riding. As soon as we finished our first ride we were right back in line for another lap. This time in the middle of the train. Check out all of my Intimidator 305 pictures. Sarah and I continued our afternoon and evening with more rides throughout the park. 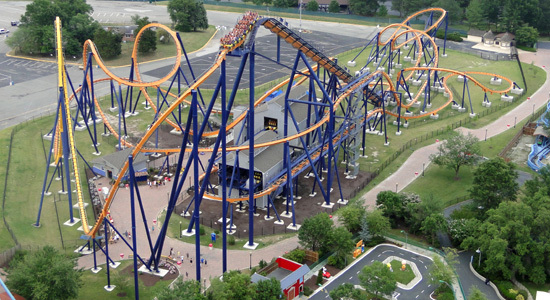 One of the rides I was really looking forward to was Dominator. Our good friend from Geauga Lake has found it's new home here in Virginia. And it looks even better now that it is surrounded with grass and midways of paver brick. The coaster seems so much bigger now that we can walk right under the drop hill and next to the huge vertical loop. Another great day of roller coaster fun. And tomorrow we'll do it again with a full day at the park.